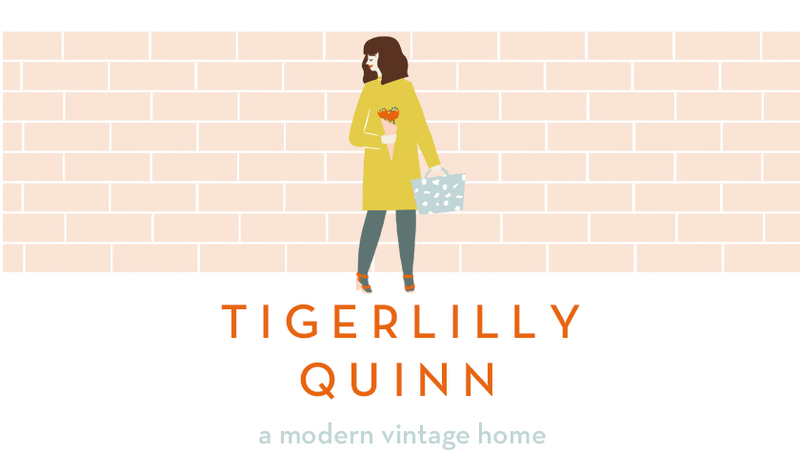 I'm a big fan of sixties inspired furniture (if you hadn't guessed yet!) and this also applies to the kiddo products we own. 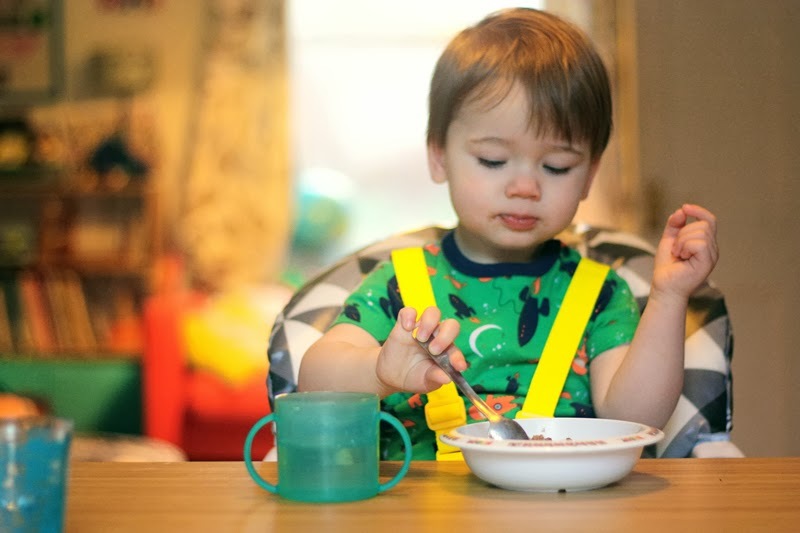 I'm pretty sure a few of our family members thought we were a little snobby when we didn't go for the standard IKEA high-chair everyone seemed to get as soon as their little ones started eating. Don't get me wrong, I am one of the biggest IKEA groupies (seriously we are in there almost weekly) but we didn't really like the design and figured if it's something we would be using for years to come then why have something in our living room we didn't like the look of? And so began our quest for the perfect high-chair. You wouldn't think it would be that hard really but this will actually be our third high-chair. We were quite taken with the idea of the Scandinavian type of chair that grew with your child and so picked up a pre-used one on Gum Tree. Actually for some reason this really didn't work for us at all, the part of the chair that held your child in was not removable and we just couldn't seem to convince Wilf to bend his legs so we could fit him in. Almost every time we tried he screamed or would hurt his chubby little thighs in the process. So as much as I loved the aesthetics it had to go. 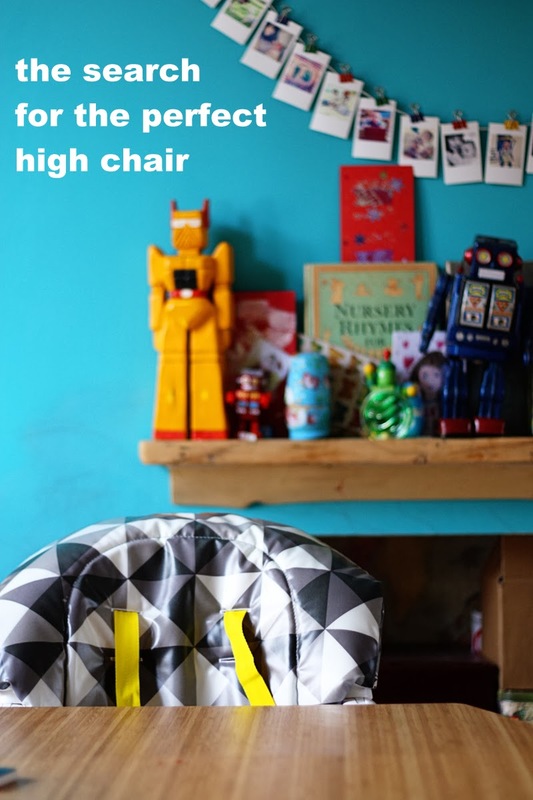 Our next high-chair was the kind that could transform from either a high chair or a separate small table and chair. 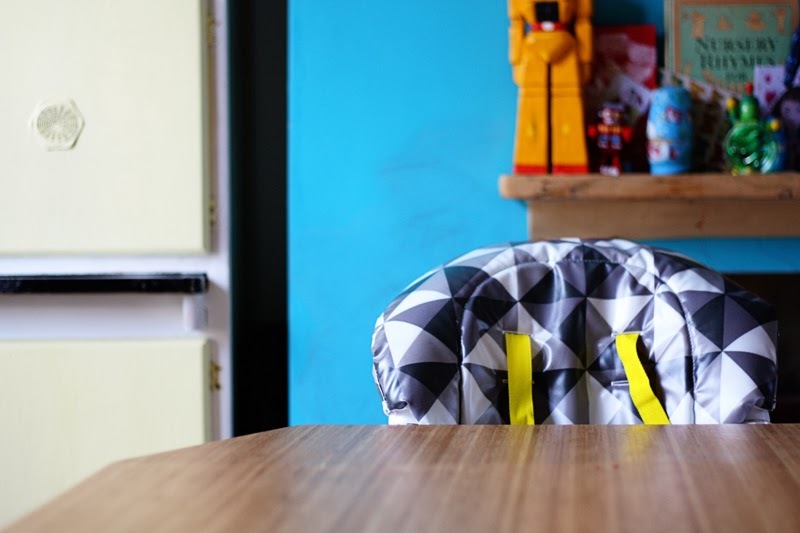 This seemed like the best of both worlds as we felt he might grow out of the high-chair and want his own space. After a few months we started using it as a small table and chair to do his colouring on (or crafting as he now calls it much to Tom's amusement) which was great for that purpose but meant it was often being used for sometime of activity and eventually moved up to his bedroom where all his paints are kept. We started to just use a cushion (or three) on a regular chair so he could join us at the table but when Cosatto offered us their 3sixti2 highchair to review it seemed like the perfect opportunity. As mentioned before the sixties inspired design was the thing that appealed to me initially but once we assembled it there were clear advances to the chair that our previous two did not have. 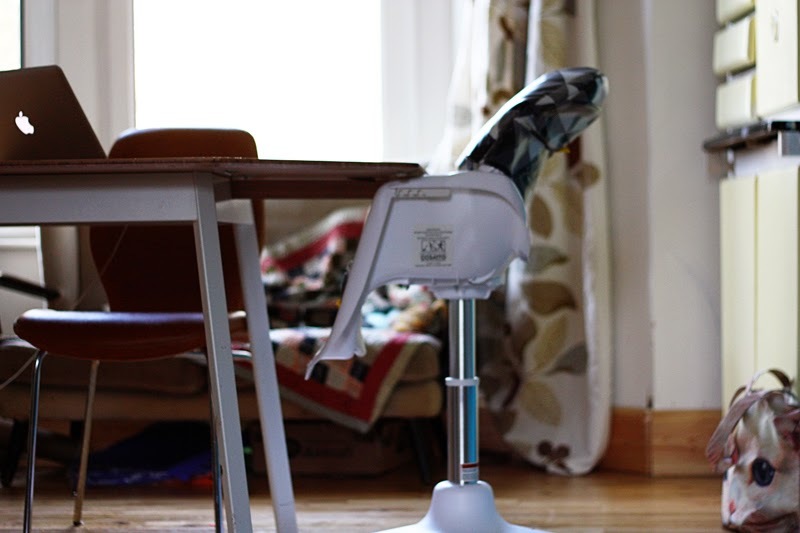 Firstly you have the option to adjust the high simply by pressing a button on the base of your chair with your foot. This means of course that you can set your child to the perfect height to your table. 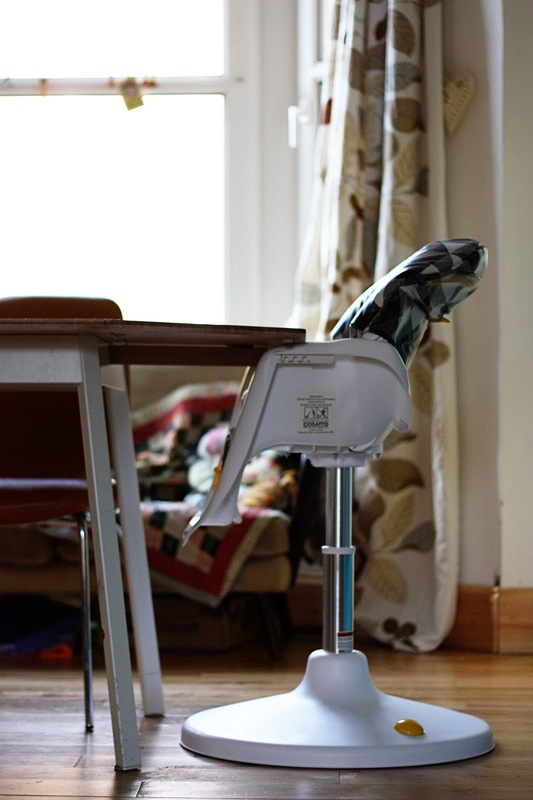 Whilst the other high chairs we have had in the past had a height adjustment option this was limited to about three settings and would be something you would have to have set up when assembling the chair. There is a tray attachment but as Wilf is older he enjoys eating from the table as we do. 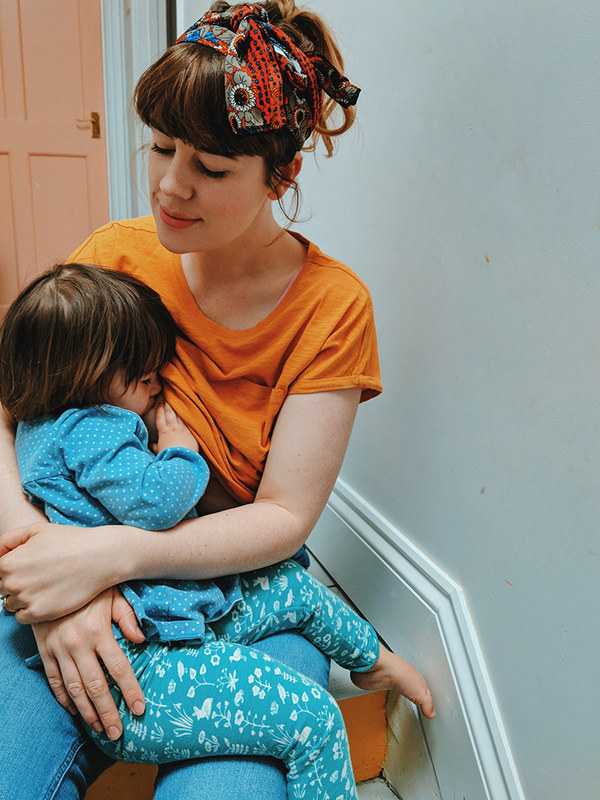 The tray would be great for little messy babies though, and is really easy to take on and off and also to adjust the distance from your child (closer for smaller babies then further away as they grow). It is also ridiculously easy to put together, I even did it myself and I'm rubbish at following instructions. I'm really impressed with the 3sixti2 from Cosatto, seems like the phrase 'third time lucky' is pretty appropriate in this instance! This looks like a fab highchair. We had highchair problems but because of space! With two highchairs nextto each other they look up a lot of space. Great pictures! Looks fab- we too have moved onto the cushion on a chair option- but this looks much safer, and probably more comfortable too. That does look perfect - wish it had been around 8 years ago :) I wanted a pedestal instead of legs that stuck out, and a chair my kids could sit in at the table. Also, most of the big makes have HUGE chairs that rarely suit a child until they are well over one, or try and do too much whilst failing to be good at anything! I really like the look of this. Our daughter sits at the table with us in her highchair but the legs are so big it is difficult to find the space to fit it in. This looks really sleek and manageable and I really like that it swivels all of the way round.